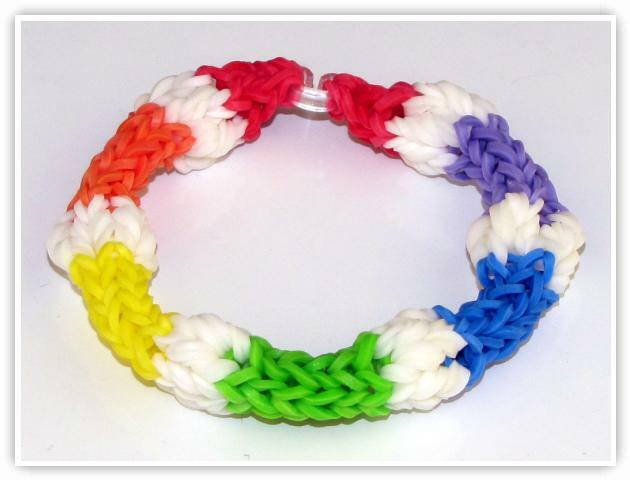 Description: This is an adaption of the fishtail bracelet and is made on 4 pins of the loom. You would need about 10 elastics per inch, and it can be made as long as you want. It is also an Off-The-Loom pattern, so its pattern flows off the loom as the pattern gets longer. This patterns also is popular if one has glow-in-the-dark elastics, because all of the elastics in the bobbles stand out, not being buried in the rest of the elastics. To make the bracelet longer, you can either add and additional bobble sequence, or add more elastics to the segments between the bobbles.